There is an Deselect all button. It unselects all addons except AddonSelector and its dependencies. Before that you can save your active addons at that time in a pack. So save addons into pack. Each time I raise a ticket with ZOS they are very helpful (when not automated) and generally ask if I have disabled all addons to check the behaviour. 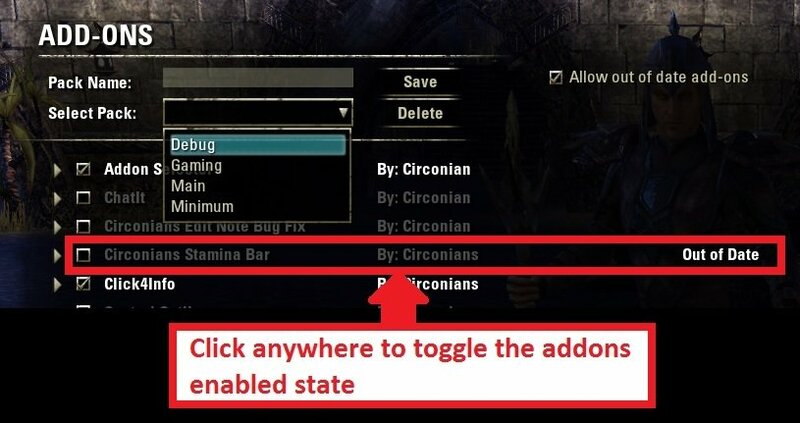 While I think it unlikely for ZOS to include a button to do this it may be possible for you to add a "Disable Addons" button to disable all (with /reloadui) except your one of course and when unchecked it then reverts back to the previous enabled addons just in the same way as is done with a user defined preset of addons. Maybe the LibLoadedAddons can be used to do this? This addon is so convenient. I didn't realize how annoying it was before I got this. Thank you for a great addon! LibStub is a library that ALL other addons somehow rely on so it is shipped with many other addons. so this addon will work too if you disable ALL other addons. Last edited by Baertram : 09/14/18 at 04:02 AM. Last edited by Baertram : 09/06/18 at 06:23 AM. ^ This comment just saved me a lot of toil and trouble. The ingame addon manager won't be able to show the dependency correct And "Votans Addon List" neither. Using votan's addon list you can see there is a dependency by hovering the mouse above the red icon in the row of your addon which is disabled. If the first entry is a , this is a clear sign there are other dependencies which couldn't be found due to a missing txt file! Read the description of the addon where the needed libraries are listed! LibStub assures that every library is loaded properly and only once with the highest version. It's basically needed for all addons using libraries. LibDialog shows a confirmation dialog and is needed for some of the "ask" dialogs. Without them the addon won't load nor will you be able to enable the addon ingame. Thanks Baertram for the update to this awesome mod!